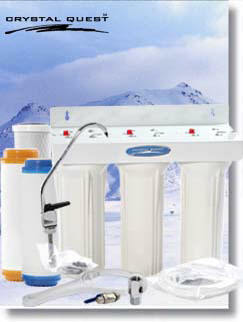 We at Natural Health Enterprises have been selling water purifiers for more than 40 years, since 1975. We have always sought to offer the most effective and highest quality products available at the lowest possible prices. Almost all the units we present are manufactured by Crystal Quest, also in business for over 30 years. Crystal Quest is approved by QAS International for the high quality of their administration systems. Our water systems are certified by the NSF (National Sanitation Foundation), which tests water purifiers for meeting standards of effectiveness such as those set by ANSI (American National Standards Institute). More about these certifications below. Crystal Quest® Manufacturing’s commitment to quality craftsmanship continues to be shown through not only being the FIRST manufacturer in our industry to be ISO 9001:2008 certified, but that we continually surpass all required audits as well. ISO 9001: 2008 is an internationally recognized Quality Management Standard that requires a company to identify, define, document, implement, monitor and measure, and continually improve the effectiveness of its processes for the purposes of enhancing Customer Satisfaction. Companies must undergo third-party audits by accredited certification boards in order to become ISO 9001:2008 certified. Selecting a manufacturer that voluntarily holds itself to these high standards ensures you will receive a quality product and dedicated customer service. With its vertically integrated processes and strict quality control procedures, Crystal Quest® Manufacturing has been dedicated to the highest standards since its inception. Click here to view NSF/ANSI 42 certification. Click here for the NSF Standard 53 Test protocol for the Eagle Redox Alloy 9500, ERA 6500 and the Granular Activated Carbon used in our water purifier systems. Drinking Water System Components -- Health Effects is the nationally recognized health effects standard for all devices, components and materials which contact drinking water. Click here to view NSF/ANSI 61 certification. NSF Standards were developed by the National Sanitation Foundation. NSF International is a world renowned scientific and technical expert in the health and environmental sciences. Its professional staff consists of engineers, chemists, toxicologists, and environmental health professionals. NSF is an internationally recognized, not-for-profit, third-party testing organization that tests and certifies home water filtration systems to ensure they meet strict public health standards. Certified products that have been tested to verify that they meet certain standards for health and aesthetics will have the logo mark on the right. This ultimately results in giving customers the assurance that the filter system they are about to buy will do what the manufacturer’s literature says it will do. 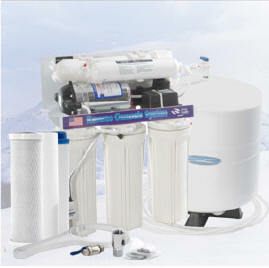 Filter reduction claims are true ensuring you are buying the right water treatment system. The filtration system is as advertised; no misleading literature and labeling. NSF International, The Public Health and Safety Company™, a not-for-profit, non-governmental organization, is the world leader in standards development, product certification, education, and risk-management for public health and safety. For 60 years, NSF has been committed to public health, safety, and protection of the environment. CE-certification or CE Marking is a conformity marking consisting of the letters “CE”. The CE Marking applies to products regulated by certain European health, safety and environmental protection legislation. The CE Marking is obligatory for products it applies to: the manufacturer affixes the marking in order to be allowed to sell his product in the European market. CE is an abbreviation for Conformité Européenne’, French for ‘European Conformity’. The CE Marking indicates that the product it is affixed to conforms to all relevant essential requirements and other applicable provisions that have been imposed upon it by means of European directives, and that the product has been subject to the appropriate conformity assessment procedure(s). The essential requirements refer, among other things, to safety, public health and consumer protection.